This pattern has been a long time coming… As I admit it was a little more challenging to invent than I had anticipated…. But I am pleased with the result. You can get a clean PDF copy here for download. – white, orange and black DK (8ply) yarn. 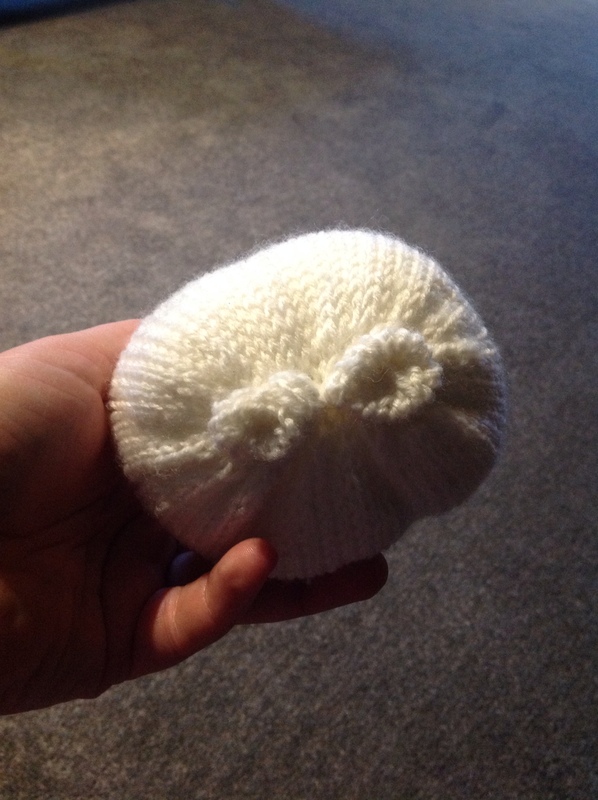 Half a ball of white… Scraps of the others. You are now onto his body. 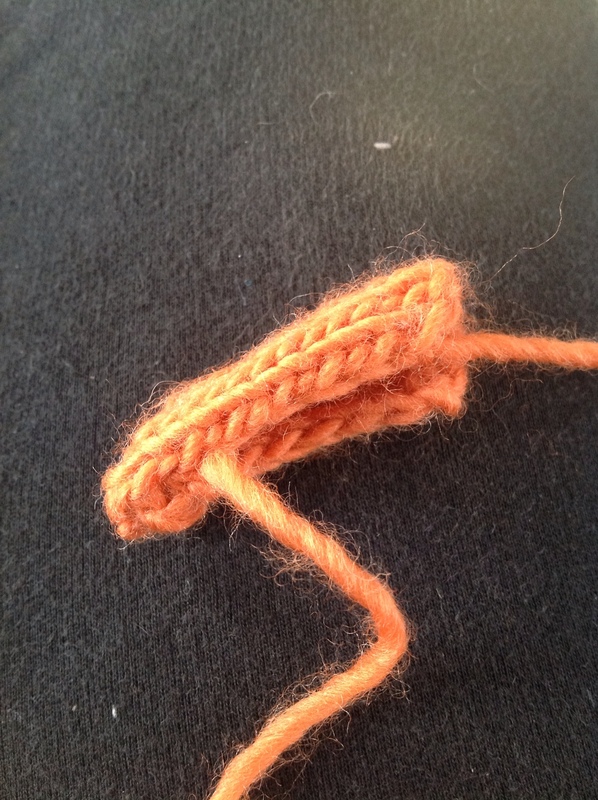 Keep a stitch marker in the start of this rotation as it will show the middle of his front. Knit each stitch front and back… Over whole rotation. This will leave 10 stitches on each needle. Knit 1, Knit 1 stitch front and back, repeat over the whole rotation, which will put 15 stitches on each needle. K2 tog, knit 1, repeat over whole rotation leaving 10 stitches on each needle. You are now starting his middle section. Knit 2, knit 1 front and back, knit 4, knit 1 front and back, knit 2. Repeat over the other needles to complete the rotation. 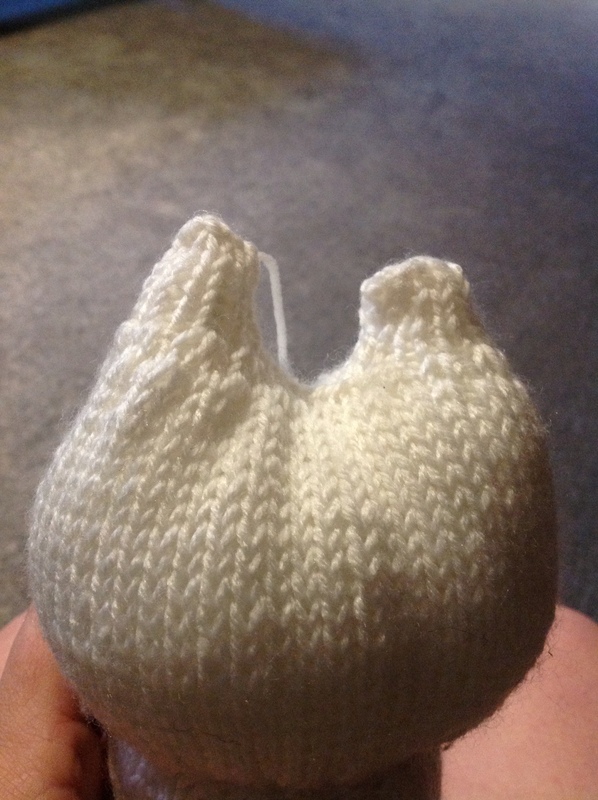 Knit 2, knit 2tog, knit 4, knit 2 tog, knit 2. Repeat over the other needles to complete the rotation. Knit 1, Knit 1 stitch front and back, repeat over the whole rotation. This will increase to 7, 8, 7 and 8 stitches on each needle. Knit 1 front and back, knit 1, repeat over first needle, knit needle 2 and 3, Knit 1 front and back, knit 1, repeat over 4th needle. 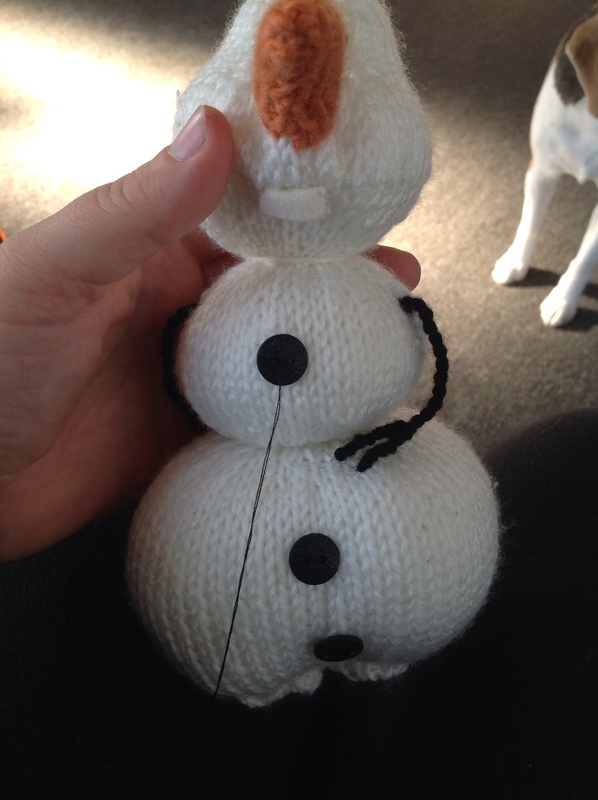 You now have more stitches on the front side of Olaf. Knit to the last 2 stitches of the first needle, knit 2 together, knit the second and third needles, knit the first 2 stitches of needle 4 together, knit to end of needle. K2 tog over the whole rotation. K2 tog, k2 tog, knit to the last 4 stitches on the rotation, k2 tog, k2 tog. 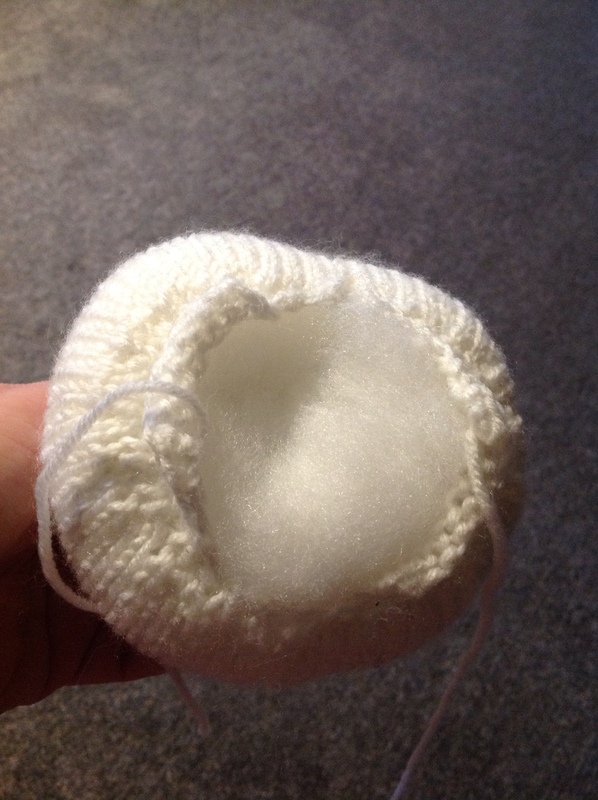 Cut yarn, thread remaining stitches onto yarn, pull to tighten. Stitch the top of his head closed. Insert 2 twisted yarn hairs on top of his head, and 2 twisted yarn arms on his sides. Stuff him from the bottom up carefully shaping his face bulges. Stitch up his legs. Squeeze his feet up to his body to create his foot. Secure with yarn. 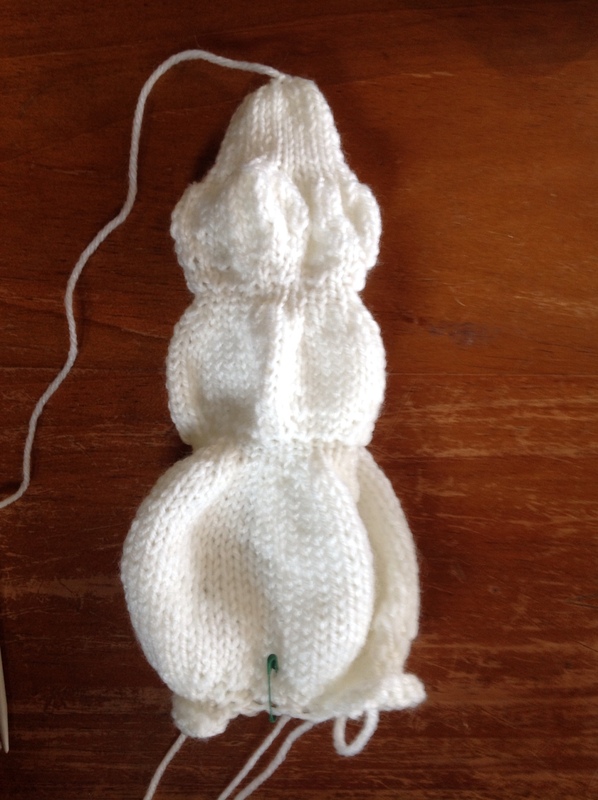 Tie 2 white lengths of yarn around his bulges to help him keep his shape. 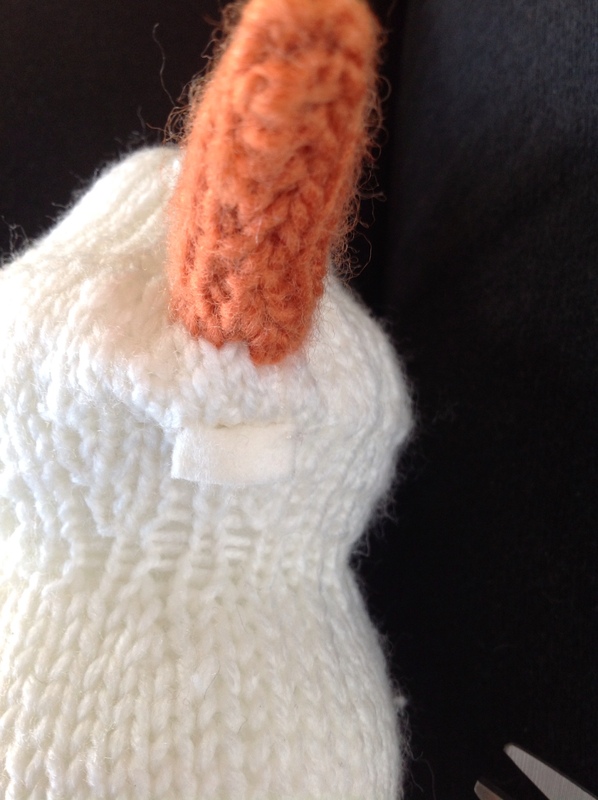 Using the white thread, shape his mouth with a few stitches, and shape his eyebrow ridge. Stitch on a small rectangle of white felt for his tooth. Cast on 9 stitches in orange. Slip 1, k2 tog, psso. Cut yarn, pull to tighten. Fold the carrot in half, stitching down the side. 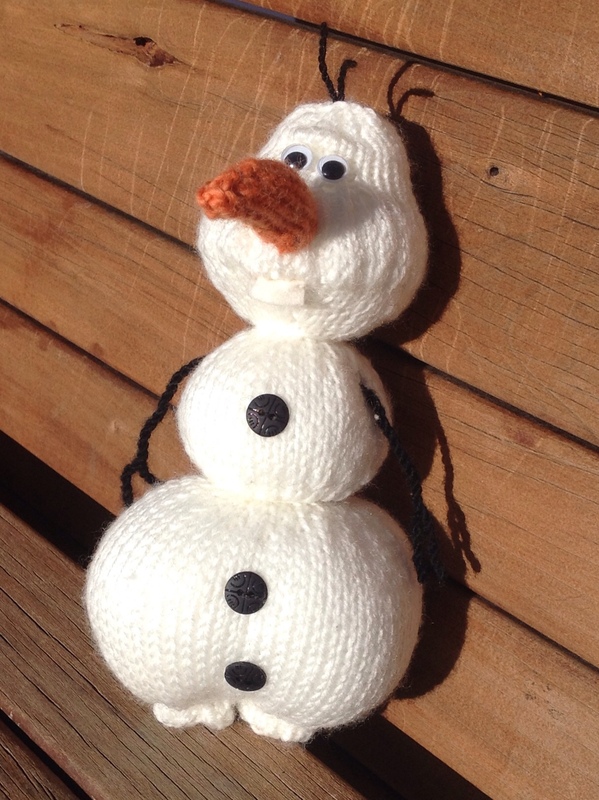 Insert a little stuffing and stitch to Olaf’s face. Stitch on 2 goggle eyes. Stitch on 3 black buttons. Ooo I’ll definitely be making this for my little one! Gah! So cute! So very glad to see this, and I can’t wait to make one! Adorable!!! Saw it this afternoon and went right to my stash and cast on!!!! This looks so cute! congratulations for making the pattern! Just wondering how did you do the hair and arms? 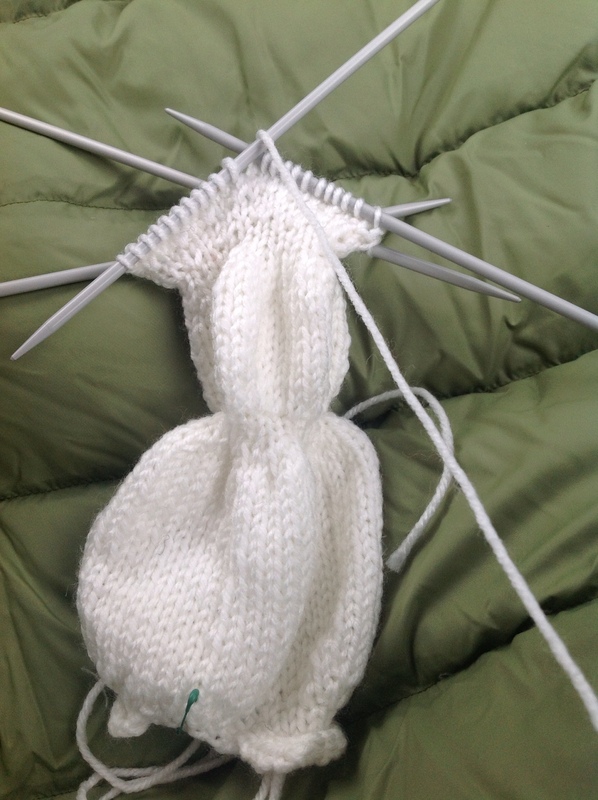 Do you think this is possible on circular needles? I’m not very good with the DPNs thanks!! Definitely do-able on circular needles- just place a stitch marker in the start of the first row in the round and use the magic loop method. 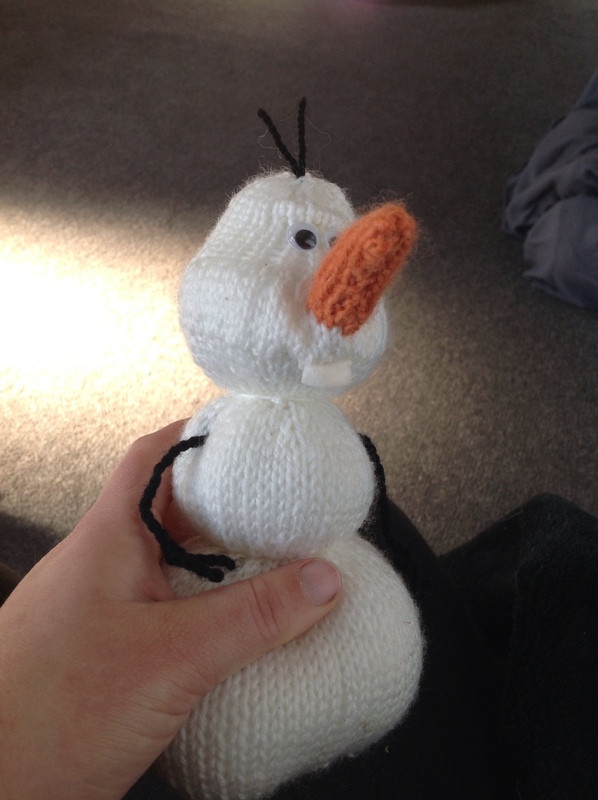 The hair and arms I did by twisting black yarn and then doubling it over itself…. it makes a thicker twisted yarn really. Hello😄 Thanks a lot for this Olaf. 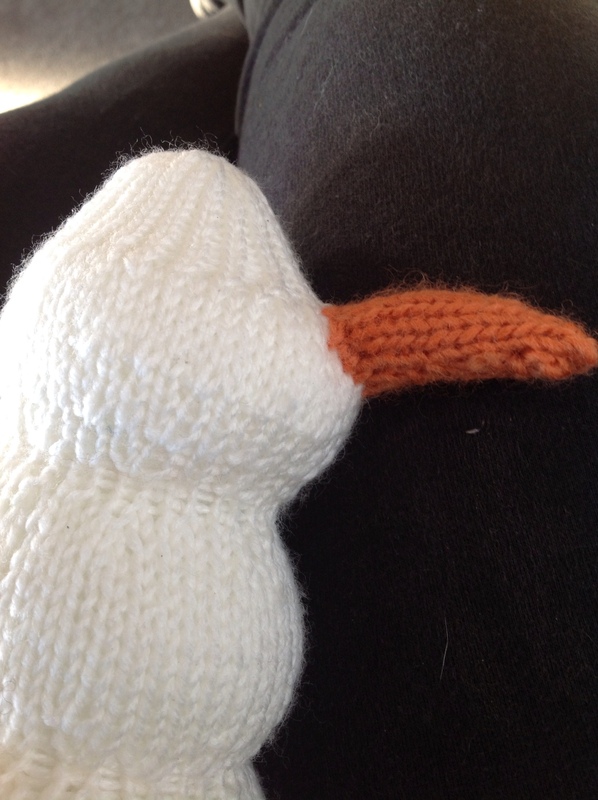 I have made a norwegian transfer for yours, and Wonder if its ok tho publish it on norwegian knitting pages on Facebook? Har du link til den norske oppskriften? So cute! What is his finished size (height)?